Fantastic fun on road and trail although the trail bit was only a quick and easy couple of hours on Saturday. 50kg less than the 950 and supposedly 20kg heavier than the 400 but I can't feel it as the tank is under the seat so the weight is low down. 66bhp is good fun for the back roads and certainly better on road than my 400 was but, with good throttle control, seems not too much for trail use. There is a soft throttle setting on the bike for the lanes but I'll see how it goes for now. There is the standard I have it on and a nutter level but I'll give that a miss for now. I've put better handguards and Zen Overland's folding mirrors on it. Need to lose the lower mudguard bracket and re-site it on the higher bit but it needs led mini indicators and I'm not feeling brave yet. 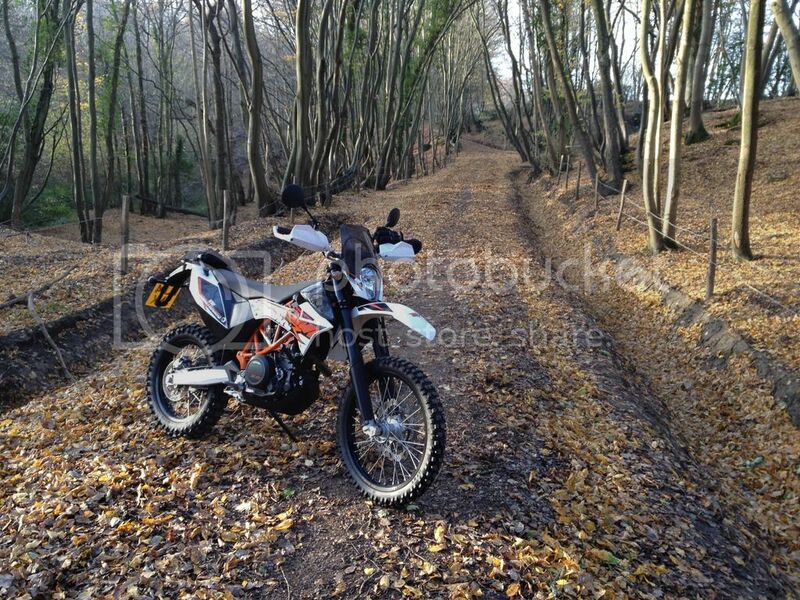 I'm also thinking about selling the KTM 400, like you can't go into details. Forgot to say...it's got MT21s on it and, so far, they seem surprisingly good on road, at least up to 80, and the light mud on Saturday. Looking for a secondhand Touratech or Rally Raid rear rack (not pannier racks) if anyone has one. It did get wet and muddy later. That was the first lane and it's a new clean and dry surface. Even after a quick wash off, it now looks a bit more used. Good choice. I loved mine. Im currently bike less and toying with going back to a 690 but depends on what I find for my budget. Shame your's went the way it did Pete (and my old Beta). I am absolutely loving it and it looks like I was slightly lucky pushing the funds to a 14 as the ABS ones get a better review. I'll have a look at the link later, thanks.